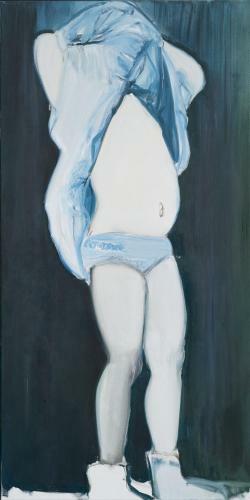 In Young Boys, Marlene Dumas’s line-up of ghostly lads is stark and oppressed against the ominous background, trailing off in the distance into mere sketchy traces of suggestion. It’s this suggestion that Dumas does best: a void of colour, a bleeding line, she creates a subtle, unnerving, perversity from an unabashed simplicity. This is painting with no frills: full on, with nowhere to hide. 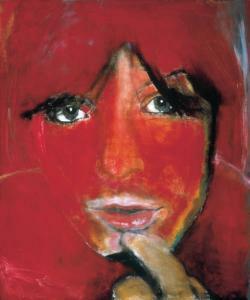 In The Cover-Up, Marlene Dumas presents a corruption of innocence. Her portrayal of a young child with its clothes lifted over its head immediately gives way to dark thoughts of sexuality and exploitation. 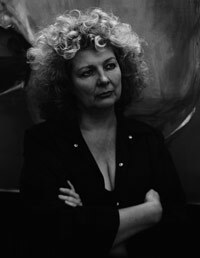 The controversy isn’t in the images Marlene Dumas paints, but in the way they’re subverted by an implied knowingness, a blatant confrontation with a natural reality and its discomforts. Jule-die Vrou is a disembodied portrait painting framed in extreme close-up; only the model’s eyes and lips are fully rendered attributes of seduction and sexuality. The rest of the painting is obliterated by a corpulent fleshy pink, suggestive of femininity, sin, violence and womanhood. The contrast between representation, and abstraction suggests a psychological disparity, where morality, representation, and social convention are questioned. ‘As the isolation of a recognisable figure increases and the narrative character decreases (contrary to what one might initially assume that this lack of illustrative information would bring about), the interpretative effects are inflamed. The titles re-direct the work, however, they do not eradicate the inherent ambiguity. One cannot interpret the painting of Jule-die Vrou without entangling some of the root metaphors applied not only to the female, but to the idea of portrayal in general’. 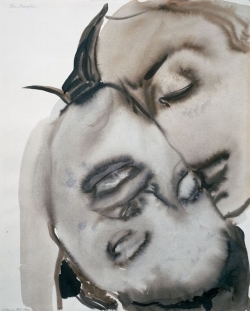 Marlene Dumas, 1992. 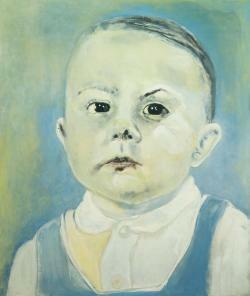 Bathed in sickly blue-yellow light, Marlene Dumas’s baby is almost repellent. Instead of an instant love affair, Dumas paints an alien encounter, the unnerving presence of an ‘other’, the realisation of an individual with a will and determination of his own. 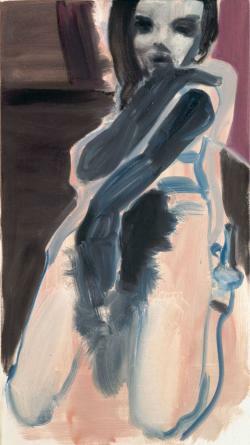 Marlene Dumas confronts the reality of motherhood, with all its natural and terrifying implications. In Feather Stola, Dumas recalls the painterly gestures of expressionism, while combining the critical distance of conceptual art with the pleasures of eroticism. The relationship between art and female beauty - or between art-historical models and twentieth-century supermodels - are constant themes in her work. For Whom the bell Tolls, Zeno X, Antwerp. Regarding Beauty, Hirschorn Museum and Sculpture Garden, Washington D.C.